This Greek feta cheese pie is such a precious choice not only for its superb fluffiness, due to the eggs and milk, but also for its sweetness as cheeses such as, emmental and gouda are also favored apart from the traditional feta cheese. Once you try Greek feta cheese pie based on this traditional recipe, you will see why this is a main dish of the Greek cuisine! Spread the first sheet folded in half and brush generously with oil throughout its surface. Repeat until half sheets of the filo (5-6 sheets) and olive oil are over. In a bowl combine all cheeses (press feta cheese with fork tines to crumble) and spread the mixture evenly on top of the last spread sheet, which does not require oil brushing. Repeat spreading the remaining sheets, also brushing them with the remaining olive oil. After spreading the last sheet, which also requires no oil brushing, slice the cheese pie with a knife in about 15-18 pieces. 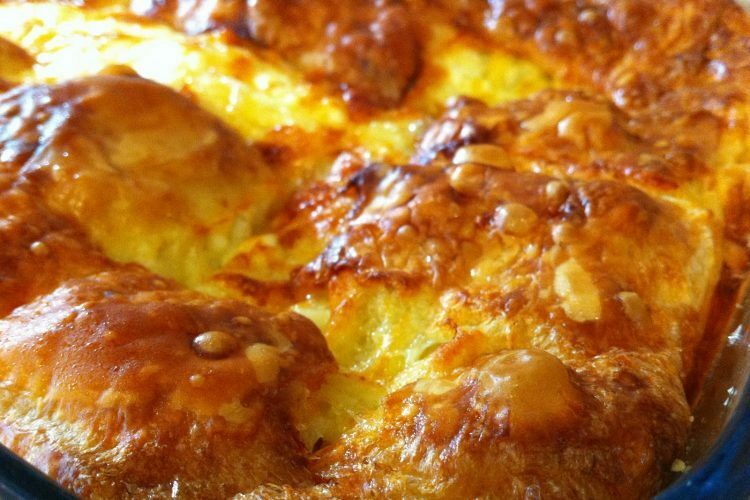 Beat well the eggs and fresh milk and pour the mixture on the cheese pie evenly until all sheets are dampened evenly. Bake in preheated oven in 210°C (upper and lower heating) for the first 5’, then lower the heat to 190°C for 55’ (total baking time should be 60’). The cheese pie should be dry and crunchy when the baking is completed. If the cheese pie is getting too brown, while baking, place an aluminum foil on the pyrex surface for protection. Avoid serving immediately, let the Greek feta cheese pie cool for 30-45’ to ensure that the individual pieces do not fall apart. You can even have the feta cheese pie the next morning for breakfast, enjoy!